School has started again, and It's the time of year where everything seems exciting and now: now teachers, now friends and even new schools for some people. This Is the theme of this month's "ST User," as well; a new exciting product and plenty of news for the ST user. Take off those shoes, find a comfortable chair and read on. I just returned from the PC Expo held in New York City, and there was one product that blew me away. It was the Hewlett-Packard DeskJet printer. It gives "laser quality" output for the price of a high-end dot-matrix printer. If there ever was a printer for the rest of us, this baby is it. The HP DeskJet uses inkjet technology that Hewlett-Packard pioneered a couple of years ago with their InkJet printer. 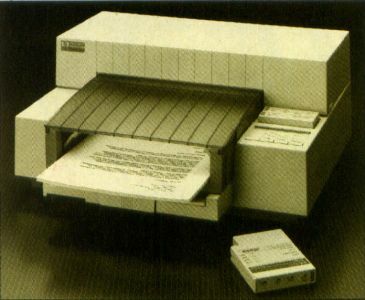 That printer required specially coated paper, was very slow, and the output wasn't as good as the then currently available dot-matrix printers, such as the Epson FX-80. "Dot matrix" simply means a matrix of dots that form the characters printed on a page. The method used to print the characters determines the quality of the output as well as the speed of the process and the cost of the product. Most home computer users usually use "dot matrix" to refer to the impact printers made by Epson, C. Itoh, Citizen, Gemini, etc. But the technology has come a long way since the early days of the Epson MX-70 with Graftrax. Impact dot-matrix printers get the characters on the page by brute force The matrix of dots is really composed of a number of pins that, when hit from the rear, poke the ribbon and put the ink on the page. The matrix of pins (the printer head) moves horizontally across the page while the page is advanced forward. To print darker characters on the paper, the printer head makes two passes per line and literally prints twice To print the best near-letter-quality (NLQ) output, an impact printer may make up to three passes across the page and advance the paper in smaller increments than one line at a time. InkJet printers use liquid ink, much like a printing press, which is sprayed onto the paper through a matrix of microscopically small holes. The operation is familiar with the paper advancing past the horizontally moving printer head, but unlike impact printers, only one pass of the print head is necessary per line. If characters are to be made darker or bold, more ink is sprayed. If a fine hairline is needed, less ink is sprayed. There are other differences too. The DeskJet uses individual sheets of paper of either letter, legal or European A-4 size No more aligning the top edge of the continuous feed paper so that a multiple page document has the same centering at the top and bottom. As each page is printed, margins are exactly the same on each. The DeskJet output is virtually indistinguishable from laser-printed output. The printer can support up to 300 dpi (dots per inch) text just like a good laser printer. But unlike a laser printer, it doesn't require multimegabytes of memory to do so. That's because the DeskJet prints the output in a real-time fashion, as it gets the data from the computer. A laser printer must first "map" the page in memory before it can print. This is where the speed of the output differs. For one page, the DeskJet may be faster than a laser printer. But for multiple copies of the same page, once the laser printer has the image, it can spit out the additional pages one after another. The DeskJet requires the same amount of time to print each and every page. Draft mode is rated at 240 cps (characters per second) and letter quality is said to be 120 cps (about two pages per minute). The actual throughput speed will depend on the type of output (text or graphics) and the software that you are using. The HP DeskJet retails for $1,000 but I've already seen it advertised for about $600 to $700 at discount. It can Emulate an Epson printer by means of a $75 ROM cartridge, the ink cartridges cost about $20 a piece, and it has the support of Hewlett-Packard's one-year warranty and toll-free help lines. There is only one minor flaw in the product as it currently stands. The ink requires several seconds to dry. In fact, the paper handling mechanism has a provision for not immediately dropping one printed page on top of another. As each new page is printed, the previous page is lowered onto the stack of output and the new one is held separately. The other problem is that, once the ink is dry, moisture will smear it, unlike a laser printer's output. These are minor flaws, and the HP representative told me that they have chemists working on ink formulations "round the clock," trying to discover a non-smearable ink formula. I hope to have a DeskJet printer soon. This is as revolutionary a product as the laser printer was when it first appeared. If you are in the market for a new printer, please check out the HP DeskJet. The Hewlett-Packard DeskJet printer gives "laser quality" output for the price of a high-end dot-matrix printer. A lot is happening in the computer industry these days. Some of it applies to Atari directly while other news bears on Atari only indirectly. Most of the news, however, even though it does not apply to Atari directly, affects Atari users in one way or another. Here now, the news. There is no question that Jack Tramiel is a difficult man to do business with. Many people dislike his rough and tough style of negotiation where Atari usually comes out ahead. But when the tables are turned, Atari is the first to scream "unfair playing field." Such was the case with the latest in technological snafus: the DRAM (Dynamic Random Access Memory) chip shortage. Atari alleged that Micron, an Idaho-based chip manufacturer, agreed to sell some chips at an agreed-upon price and later reneged on the deal. Three million, 256 kilobyte chips were involved in the legal suit that Atari brought against Micron. Atari had sought damages for alleged violation of antitrust laws, breach of contract and bad faith. Sam Tramiel accused Micron of "destroying the competitiveness of the American microcomputer business" through its pricing practices. And Atari claims that the shortage of Mega STs in the U.S. is due to the chip shortfall. The DRAM chips in question have been in increasingly short supply over the last year, due in part to the restriction on Japanese chip manufacturers. Because of these reduced imports, manufacturers of computers and video games have been unable to obtain enough chips to maintain full production. Micron is one of the few remaining U.S. manufacturers of DRAM chips and like other chip makers has been profiting from the shortage. Recently, Atari announced that it reached an out-of-court settlement with Micron. Although Micron had filed to have the charges dismissed, the settlement was reached before the motion was brought before the court. Both Atari and Micron would not disclose the terms of the settlement other than to say that they each were "happy." Further, Atari is looking to acquire or start a chip manufacturing facility either in Asia or the United States. In the recent hullabaloo concerning WordPerfect's supposed withdrawal from the ST software market, WordPerfect Corporation not only said that they would continue to market WordPerfect (WP) 4.1 for the ST, but that they would also be bringing out additional ST products, including a WP 5.0 version. The company would not disclose a ship date for the product (that got them into trouble once before), but they did say it probably would be out sometime in 1989. I was able to view the PC version of WP 5.0, and to minimize the amount of drooling that is going on in the Atari ST camp waiting for WP 5.0, I'll mention some of the new features of that program. Of course, there is no guarantee that the ST version of WP 5.0 will look anything like or have the same features as the PC version. The main differences between WP 4.2 and WP 5.0 for the PC and compatibles lay in better performance, improved documentation and new features. WP 5.0 has moved further towards being a desktop publishing program with increased use of multiple fonts, laser printer support and a multiple-view preview feature at two magnification levels. WP 5.0 has also improved its graphics handling features with the capability to import graphic file formats from Lotus 1-2-3, GEM, Mac Paint, Autocad and others. I cannot possibly cover all of the details of the new PC version of the program in this space. But I can say that with this new release, WordPerfect has maintained its position as the best PC word processor currently available. For ST users, WP is not only the best word processor, its really the only one in its class. It will be interesting to see what WordPerfect Corporation does to the ST version to make it even better. Do you remember the early days of Atari computing when you could buy an Atari computer at many department stores such as Sears or Macy's? At the time you could probably buy a Commodore machine at even more places, but that is a topic that has been previously discussed. At any rate, Atari and Commodore dominated the market. I remember my local Sears store (hey, it's where America shops, right?) had Atari XL, Commodore 64, Apple II and Coleco Adam (huh?) computers all lined up on several display aisles. Software and hardware were sold by clerks who didn't know a disk drive from a toaster, but the stuff was being moved in big quantities. Then the bottom fell out of the market. Real PCs (I'll get some hate mail here) became less expensive and more common too. I don't think that same Sears store has had a computer in stock in years. Of course, there was and still is the Sears Business Center that caters to IBM PC and clone machines, but that is a separate store. The tide has turned again. Department stores are bringing back PCs, but the difference is that now those PCs aren't Atari PCs. Catering to the home business user and families, department stores such as ZCMI, Macy's, Lazarus, Sears, Burdines and Dillards are stocking Apple, Epson, Amstrad, AT&T, Commodore and Blue Chip computers selling from $500 to $2,000. In a recent survey of the abovementioned stores, only one (Utah-based) ZCMI was carrying an Atari product: the 520ST and 1040ST. The department stores are targeting unsophisticated users who want to trade up to a low-end system from a typewriter or word processor. The stores are also packaging systems into applications such as word processing in order to draw customers in and convince first-time users to buy. A bundled system makes it easier for the novice user. Why is Atari's name absent from the list of computer products that these stores are carrying? Good question. It could be Atari's lack of advertising. For the last three years or so (since Jack Tramiel bought the company, come to think of it), Atari has done little or no advertising for any of their computer products. Not to create a chicken-egg problem here, but the reason stores are not carrying Atari products may be because users don't want them. As of March 1987, about 16% of U.S. households had personal computers. Today, according to Computer & Software News' Annual Home Market Study, about 19% of households have computers. According to this same study, Commodore is the brand of PC most likely to be found in the home, followed by Apple, IBM, Tandy, Texas Instruments and Atari. Comparing 1987 and 1988 figures, Atari dropped from a household share of 6% to 3%. The only machine found less often in homes is the Coleco Adam, at 1 % in both 1987 and 1988. According to statistical analysis, conclusions cannot be reliably drawn from data in the 1% to 5% range. The exact amount depends upon the number of people responding to the survey, but this means that the error in data gathering could be large enough to obscure the data itself. Of even more interest to us and the department stores who are selling PCs is the brand of computer that people are most likely to buy. In March 1987, 1% of the survey respondents said they were planning to buy an Atari computer. In May 1988, 1% also said they were planning to buy an Atari computer. Apple and IBM were the brands reported to be the most likely to be purchased. In fact, over the course of the year, Apple gained share while IBM lost it. What is going on here? People say they don't plan to buy an Atari computer so the stores don't sell them. The stores don't sell Atari computers because folks say they don't plan to buy Atari. In either case, the result is the same. Atari's share of the U.S. market is dwindling while other computer manufacturers succeed. At least the Atari ST computers are hot in Europe. Being an Atari computer user is never an easy task, but it sure is fun. See you next month.